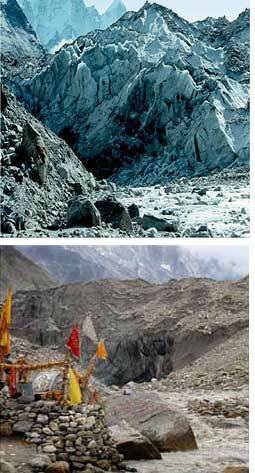 Science seems to have been the casualty in the study on glacial retreat in Gangotri, source of the Ganga. The Uttarakhand government had commissioned a study to an expert committee in 2006. The committee came out with a report in December 2007, which scientists said was dated and "full of flaws". Based on the report's findings, the state issued a five-point public notice on July 17, 2008, stressing on control of anthropogenic activities to prepare against risks resulting from the glacial melt. The points include entry to Goumukh (the terminus of the Gangotri) being restricted to 150 people everyday, free entry only for sadhus of recognized bodies, check on the number of cattle entering the region and ban on disposing of non-biodegradable waste. G D Agarwal, a scientist based in Chitrakoot, Madhya Pradesh, says though check on anthropogenic activities is welcome, the five-point charter is impractical. "Some of the ashrams in the region can house 500 people. How will the government check entry of people in such ashrams?" he asks. The notice has come in for criticism from the committee members as well. D P Dobhal, scientist at the Wadia Institute of Himalayan Geology, Dehradun, said, "Why did the government include controlling cattle entry? There is hardly any vegetation there for grazing." But wasn't the notice based on the recommendations of the committee? Dobhal clarifies: "We did not mention this. We had emphasized controlling tourist-movement." However, there is criticism galore on the expert committee report. The report was drawn up after a series of meetings and inferences, without any physical verification of the problem of glacial recession. Between 1962 and 1991, the glacier receded 580 m. The committee studied data until 1991, which does not indicate the magnitude of the problem. "The committee should have laid emphasis on climate change, black carbon emissions and global warming. But they concentrated more on anthropogenic activities--a secondary factor for recession. It is true though that we have very little information about Indian glaciers because we do not have many weather monitoring stations near them," says Syed Iqbal Hasnain, scientist with The Energy and Resources Institute (teri), New Delhi. Explaining why such a mechanism is important, Hasnain says, "The glacier depends on summer precipitation for its nourishment. Receding snowline and decreased precipitation due to global warming are the problem areas. The committee should have emphasized on monitoring climate change and snow precipitation on the glacier and changes in mass volume." Dobhal says they did recommend a round-the-clock mechanism to monitor mass and water balance and censors to estimate soot deposition on glaciers. B R Arora, chairperson of the expert committee and director of the institute in Dehradun, does not buy the "climate change" argument. "Climate is the average of three decades' weather. The much ado of scientists about climate change is basically their concern for change of weather, which is a day-to-day factor. This hardly has any effect on recession. It is the anthropogenic activities that contribute much to the problem. Besides, we don't have quantitative data. Specialists can only draw inferences," said Arora. He probably discounts the fact that several studies have established that the alarming retreat of the glaciers is due to the warming trend. A university of California study in November 2007 had said, "The elevated regions of the Himalaya, including Tibet, have warmed by more than 1C in the last century." Implementing agencies are another problem area, say critics. The state department of power has been directed to make it mandatory for hydel power projects to have discharge gauging and meteorological stations in the upstream catchment areas. Information collected from these areas should be made available to departments concerned. "It would be foolhardy to expect power projects to set up such stations. At the most, another committee will be formed, which, like the expert committee, will furnish a report based on inadequate data," Agarwal contends.